NEW YORK, NY - (@TheComedyNews) - Jewish Americans will have a new reason to get down with some holiday cheer this winter: the first-annual MatzoBrawl is set to take place live from Madison Square Garden on Christmas Eve. MatzoBrawl will feature one-on-one boxing matches between prominent Jewish celebrities. Fresh off his recent suspension from the PGA Tour, golfer Happy Gilmore will be certain to have some aggression to blow off in the boxing ring. The hockey player-turned-golfer is known for his short temper, which will serve him well in the later rounds. Knibb High School physical education teacher Billy Madison's best hope for a knockout hinges on two factors: keeping the trash talk to a minimum, and showing up to the fight with a blood-alcohol level below .08. Gene Simmons, the Israel-born frontman to K.I.S.S. 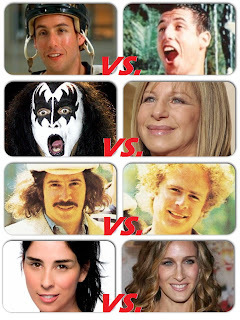 will clash with Barbara Streisand---an equally as overrated popstar who's relevance was also left in the 1970s. Since both competitors refused to "condescend to wearing frumpy boxing gloves", officials have allowed both Streisand and Simmons one foreign object. Streisand is expected to use one of her eight Grammy awards as a weapon, while Simmons will likely do something that involves either fake blood or his grotesquely deformed tongue. Still, both celebrity-boxers are expected to quit the fight when their excessive makeup starts to smear. Having been buddies since their elementary school days in Queens, folk rockstars Paul Simon and Art Garfunkel have gone in and out of personal clashes. While they have been reportedly getting along for the last decade, both Simon and Garfunkel will reunite in the center of Madison Square Garden to box their way into another hiatus. 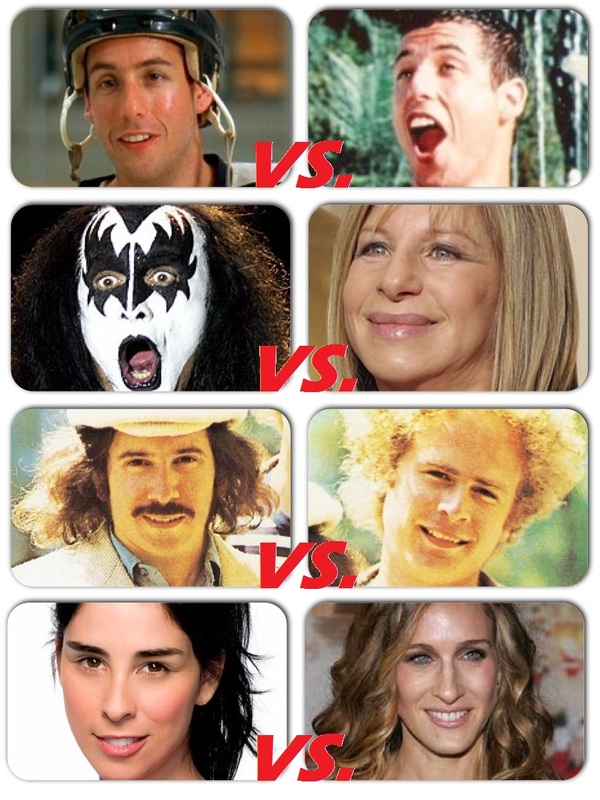 In what is being billed as "The Battle of the Sarahs", comedian Sarah Silverman will fight Sarah Jessica Parker in the opening boxing match of MatzoBrawl 2012. Stipulations: If Parker wins, Silverman has to go a week without using profanity. If Parker loses to Silverman, Silverman gets to have a night-on-the-town in Chicago with Parker's husband of fifteen years, Matthew Broderick. *MatzoBrawl is not affiliated with the annual Christmas Eve meat-market, Matzo Ball. All puns are purely coincidental.